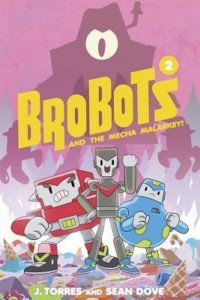 Graphic Novel Review 255/365: Brobots And The Mecha Malarkey! Not many sequels on this list of mine, but the Brobots are just too much fun! Title: Brobots And The Mecha Malarkey! Way back at review 15, I reviewed the first Brobots book from Oni Press. You can read that review here. I didn’t plan on having any sequels on the list, but I’m in New Orleans on Spring Break, sitting here eating breakfast, I was looking for something fun to read. I happened to have a digital copy of the second Brobots book with me, so hey, that’ll do, pig! I had such a blast reading this silly little story that I decided to bring you my thoughts on the second Brobots book. The back of the book has a blurb from the School Library Journal stating that this book could be for fans of “Voltron and Transformers.” And as a good uncle that has bought both of these books for my niece and nephew, I can say that these books are more for the kids of the fanboys and girls out there. Yes, Brobots takes the reader back to those classic franchises, but they also allow for new readers to explore new worlds that might take them into some of those old stories, and with great re-tellings coming out like the newer Voltron on Netflix, the doors are open to create a whole new generation sci-fi fans. And that’s exciting! The art by Sean Dove is as fun and colorful and silly as the first book, and the writing by J. Torres is once again packed with stupidly brilliant puns. Our main baddie here is The Semisweet Chocowitch of Crime Brulee Mountain. And there is a bro-lific use of bro-tastic bro-based bro-minology…I love it. It sound cliche, but this book is as much for the adults reading it as the kids. The writing and art contain a level of sophistication that truly appeals to all ages. I dare you to read this book at any age and not smile!